Willow Creek Crossing Apartments Fort Wayne Congratulates Winners! 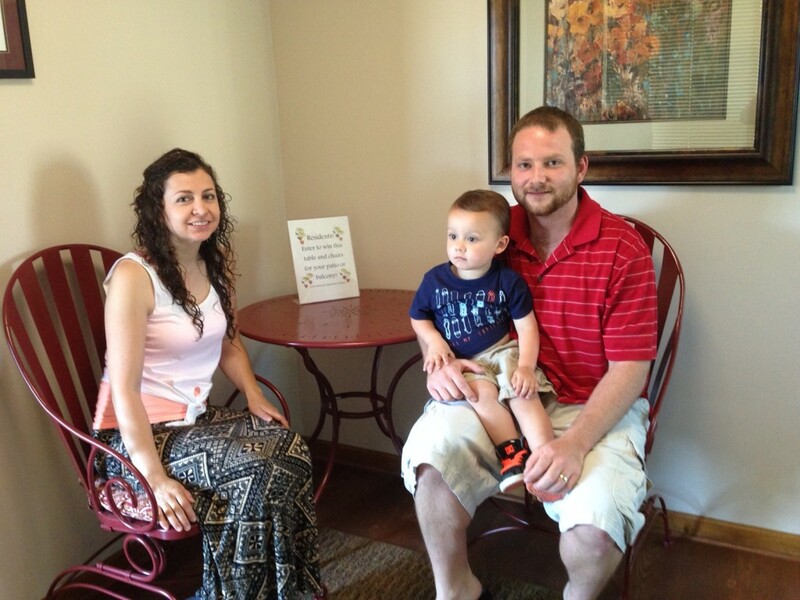 The staff at Willow Creek Crossing Apartments would like to congratulate Monica and Zach, the winners of the patio set giveaway! 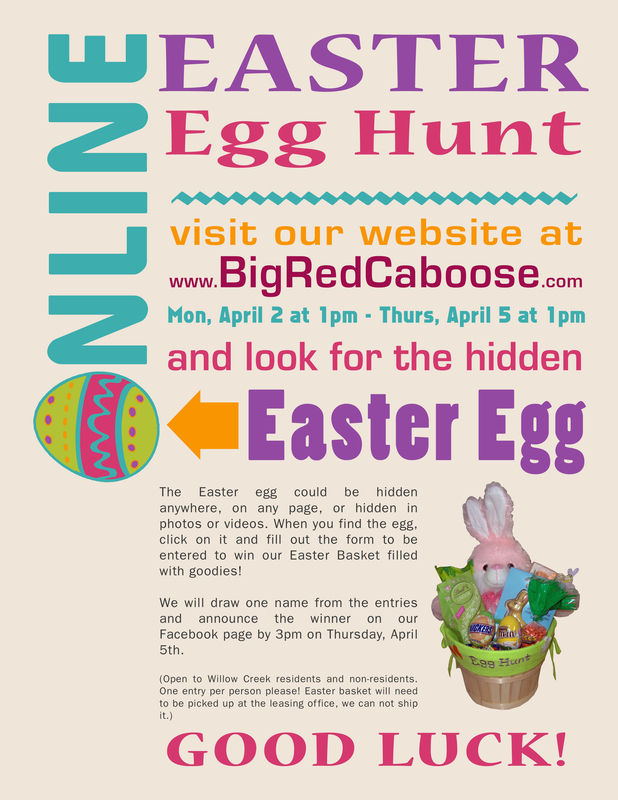 Willow Creek Crossing Apartments Online Easter Egg Hunt! Willow Creek Crossing Apartments is having an Online Easter Egg Hunt! Visit our website at www.WillowCreekCrossingApartments.com starting Monday, April 2nd at 1pm to Thursday, April 5th at 1pm and look for our hidden Easter egg! The Easter egg could be hidden anywhere, on any page including in a photo or video! Once you find the Easter egg, click on it and you’ll be taken to a form. Fill out the form for your chance to win our Easter basket filled with goodies! A winner will be drawn from all entries on Thursday, April 5th and posted on our Facebook by 3pm. One entry per person please. Online egg hunt is open to residents & non-residents. The winner will need to pick up the Easter basket at the leasing office, we can not ship the basket. Facebook BINGO stars Oct. 31st! Have fun and win prizes with facebook BINGO! Pick up a Bingo card at the Willow Creek Crossing Apartments leasing office. Bingo Cards were delivered to residents along with newsletter. Non-residents can pick up a Bingo card at our leasing office at 7501 Lakeridge Drive in Fort Wayne. The first person to post “BINGO” to our wall and then bring their correctly completed bingo card showing 5 in a row (straight line or diagonal) to our office will WIN! Even after someone has announced BINGO we will continue to give out numbers until they bring their card to our office and we verify that they have won. So keep playing until we announce a winner! Once we announce a winner, a new game will start the last business day of the month with a different colored bingo card that can be picked up in the office. One card per apartment/household. The bingo number will ONLY be available on facebook and on the door of the clubhouse, it will NOT be given out by phone. The first person to show 5 in a row wins (straight line and digonal). We will announce the winner just as we do the bingo number. This game is in no way sponsored, endorsed, administered by, or associated with, Facebook.